When you become a member of Marriage Mentors United, you'll receive a comprehensive "how to" manual for Marriage Mentors called the Field Guide. In it, mentors will find handy and useful information on how to conduct their mentoring relationships including 19 exercises essential for successful mentoring. 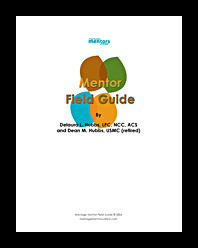 Also in the Field Guide is information on how to establish rapport, how to prepare yourself and show up as mentors, reporting requirements and sample forms for you to use, a proposed Relationship Agreement and several exercises for you and your mentorees. Some exercises are incredibly fun while others help to discover "stuck spots" and how to overcome them. Overall it's a way to embark on and discover what it is about us that makes great marriages and what we can do to make them even better. A must for "tried and true" marriages and also for those who've "tried everything and it still doesn't work" marriages. • Access to the Members Only section of Marriage Mentors United where you can download, print or email the individual exercises you use with the couples you mentor. No need to photocopy exercises from your book, just download and print or email. What could be easier? • Attend monthly webinars and tele-seminars conducted by our training team on all aspects of marriage mentoring including trainings on how to mentor, ways to use exercises from the Field Guide and information on handling common mentoring situations. There's no need to buy two! The cost per couple is only $35.00. And you'll find that one copy of the Field Guide is sufficient for a couple to share. Membership is automatically renewed after one year. You may cancel your membership at any time. COST: $35.00 + shipping & handling.